There is something about the forest which excites the primordial. Every few months, we (my wife and I) get the urge. Perhaps, the ancient Vedic Ashram system of Vanaprastha is embedded in our genes! Summers in India are the bane of the compulsive traveller, when high temperatures are a extreme deterrent to travel for pleasure. Yes, one can go to the hills and mountains, but experience tells us that so do some few tens of thousands of people-thereby stretching to nearly breaking point, the frail infrastructure and utilities that hill station has to offer and severely testing the natural goodness of man. 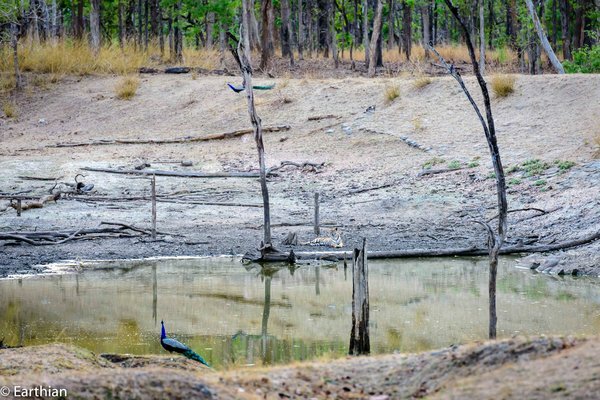 Though we abhor the heat, the lure of the forest is intoxicating and given the fact that the National parks (most of them) close during the monsoon season, we decided to visit Pench and Tadoba National Parks- forests that had not yet been explored by us. The plan was to travel by train from Ahmedabad to Nagpur, drive down to Pench and then Tadoba and return by train. It had been years since we had travelled by train and as some friends were accompanying us, we thought it would be fun. Tickets were booked and to our chagrin were wait listed for both sectors. Our friends, however got confirmed berths. Next came the permits. 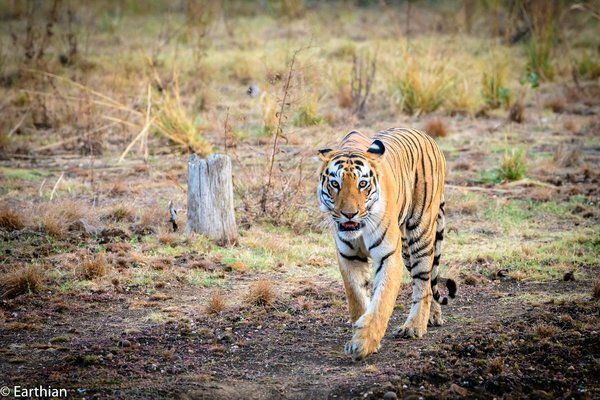 We managed to get a few permits for the core sectors in Tadoba and booked the majority in the buffer zones. Though, i was a bit despondent about not getting (all) permits in the core zone, little was i to know that it was probably the best thing that could have happened. The plan was to leave on 18th May by train and return on 29th May. On the 16th May, the contact who had promised to get our berths confirmed on some quota reverted stating that while the Ahmedabad-Nagpur sector would get confirmed, the return journey could pose some problems since the train was not starting from Nagpur. It was a god given opportunity and we decided to drive down. We had less than 24 hours to make preparations and we made haste. 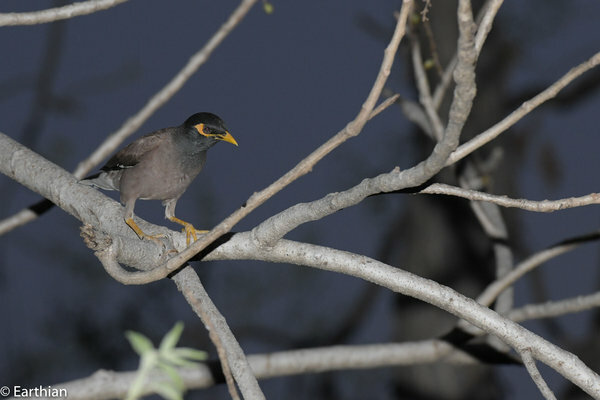 We would halt overnight at Indore and then proceed to Pench the next day. We started at 0830 hrs and reached Indore by 1500 hrs, breaking on the way for a leisurely lunch. 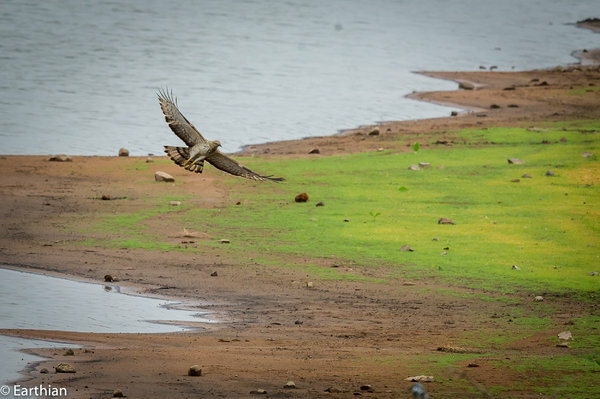 Our hosts urged us to spend a night at Tamiya, a little known hill station, and well known for its Griffon vultures. The next day, after a sumptuous breakfast, bordering on brunch, we left at 0900 hrs for Tamiya, where we had managed to get a room booked in the Forest Rest house. Unfortunately, in my haste, i had blown the fuse of the connector of the cooler (by plugging it wrongly) and we had to spend an hour more at Indore in getting it fixed. The journey was eventful, thanks to the glitches cased by Google maps, and after meandering through bad roads and villages off the beaten path, we finally reached Tamiya at about 1730 hrs. The FRH is an old property situated in a beautiful location overlooking the Patalkhot Valley and commanding the best view on offer. The Griffon vultures nest in the cliff face and every morning at sunrise they go out scavenging to return at sunset. 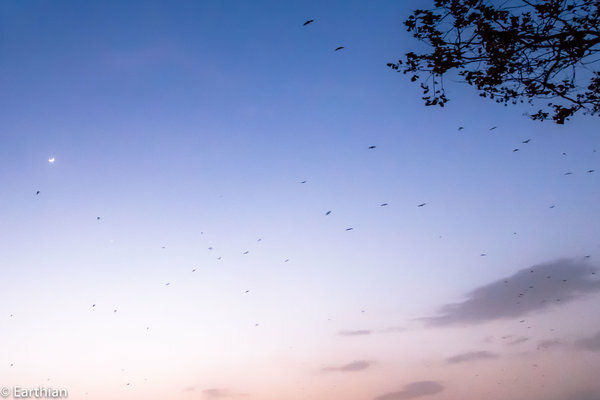 While going out in the morning and returning, they circle overhead and it is a wonderful sight to see hundreds of vultures circling in the sky. After an early dinner, cooked to our taste by the diligent and attentive staff at the rest house, we retired for the night after spending some time in the night air. 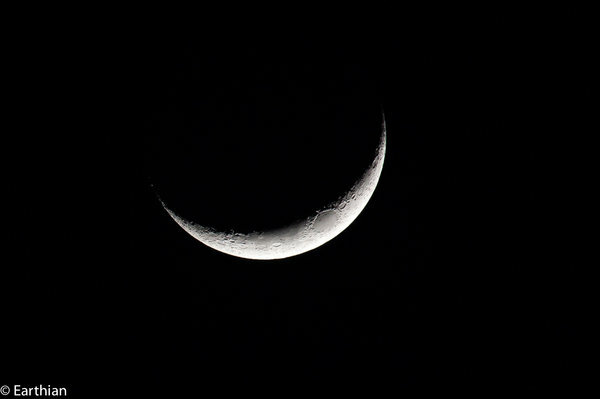 It was not cool, but not uncomfortable, and i fooled around with some moon shots. 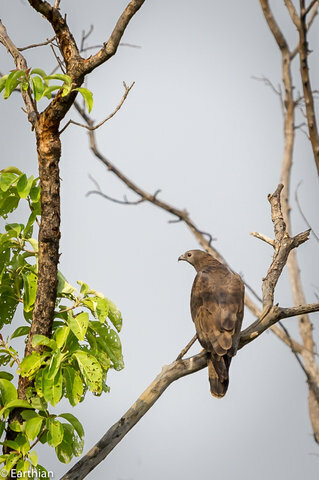 The next morning i got up at 0500 hrs and proceeded to trek to the vulture point accompanied by a forest guard and his friend and a couple of dogs who had taken upon themselves to lead the way. It was a good one hour trek, mostly moderate, with the last 50 meters quite challenging, due to loose rock fragments, dried leaves a foot deep between rocks and a steep rocky climb. That is the Vulture Point. The view is worth the trek, though the early morning haze was a deterrent. 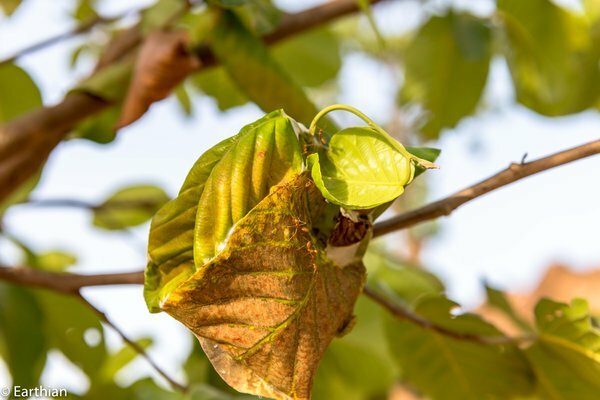 The fire ants, build their nests among the tender leaves of the teak tree by bending leaves and adhering them with a secretion. It is amazing to see what a sense of purpose, determination and common objective can produce. We reached the top and felt a sense of achievement. Sadly, the point has not been maintained and there were examples of the usual culprits who had defaced the rocks, professing their eternal love for their beloved. Empty plastic water bottles were also carelessly littered along with the odd empty liquor bottles. I feel a sense of loss when i see such littering. What makes us litter? Yes, proper disposal bins are absent, but that is no reason to throw bottles and break them. We made fast progress on the way back, encouraged by the dogs who kept urging us on. After a good breakfast and freshening up, we departed for Patalkot. Patalkot has been recently "discovered" and the evils of urbanisation and the "civilised" world is fast catching up with it. Patalkot, literally meaning, Hell's way, was home to some 2000 tribals-Gonds and Bharias. 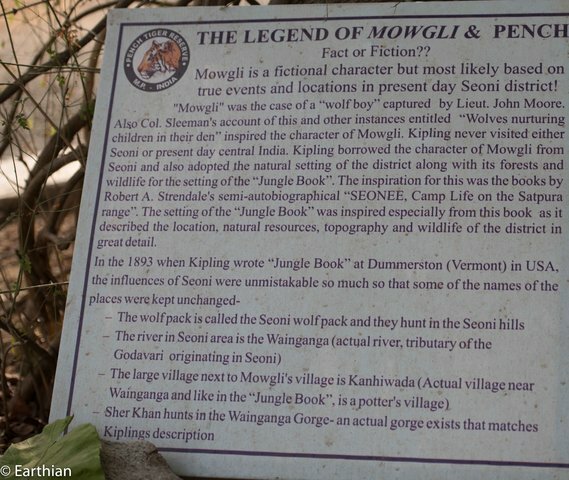 There have been many unsubstantiated and imaginary stories about the place and the tribal folk living there. 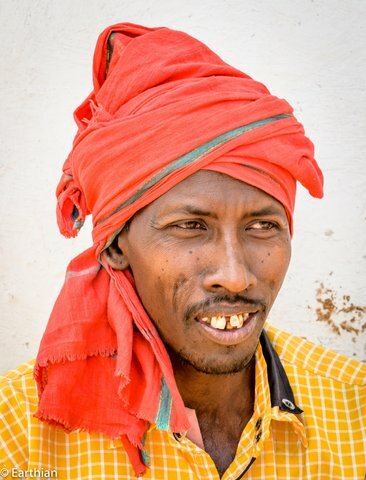 Due to a rare genetic mutation, the tribals were stunted, almost dwarf like and had to suffer the indignities and false allegations made by "normal" people who somehow tend to malign those who do not conform to their known sense of what is considered normal. Absolute ignorance. We drove down to the Valley to a look out point from where it was a hour's trek to the place these tribals dwelled. 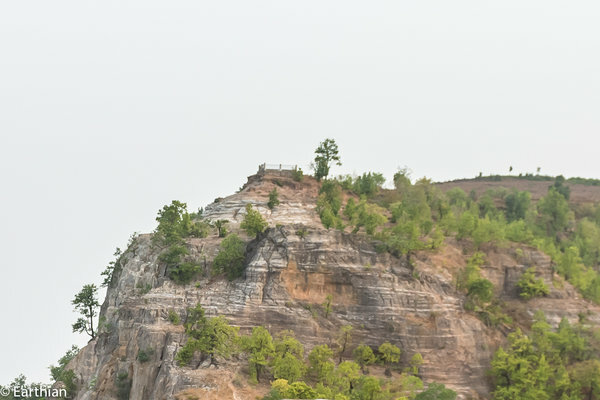 Since we did not have the time, we chatted with some tribals at the look out point selling jadi-butis. They were quite friendly and pretty normal and not at all stunted. We bought some jadi-butis, more to encourage them, rather than need and proceeded onwards towards Pench. 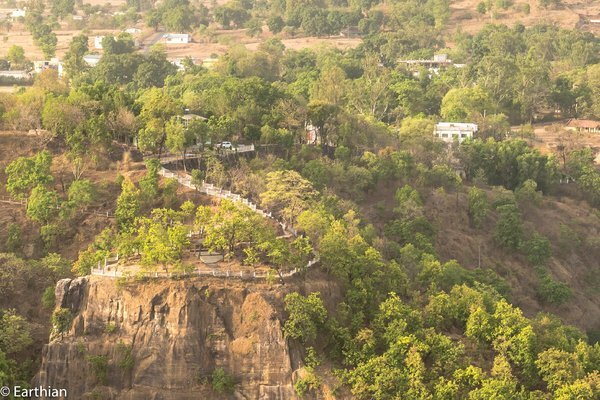 I first learnt about tamia and patalkot from a post by steven_ber. He had gone there perhaps a decade back. It's great to see someone else has too. I look forward to more posts. Vaibhav, could you kindly correct it? Thanks. My reputation , whatever left, is mutilated. edit: Have done it. Was away when i saw your post and could not correct it. 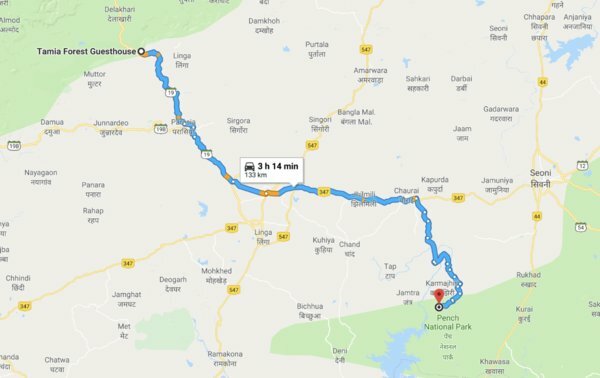 It was a relatively short drive (or so we thought) from Tamiya to Karmajhiri in Pench National Park. After our Patalkot visit, we set off leisurely. We had a packed lunch with us and we were in no hurry. Travelling by road enables one to see sights that would not be possible if one uses others modes of travel and we made the most of our opportunity. We stopped at a picturesque place for our picnic lunch and chatted with the locals when we stopped for some refreshments. Every thing was fine till we had to leave the (high) way and as directed by Google proceed in some small off beat roads. It was a disaster. We travelled through villages with pathways so small that not even a motor cycle could squeeze through when we were coming from the other direction. And after we crossed the village and heaved a sigh of relief, we were astounded. The road had ended. There was no road. One minute there was a road. The next minute, nothing. Just fields and barren rocky land. There was no where to go! Going back through those narrow lanes was not an option and i was at a loss. Presently, we encountered some shepherds tending their stock and enquired the way to Karamjhiri Gate. 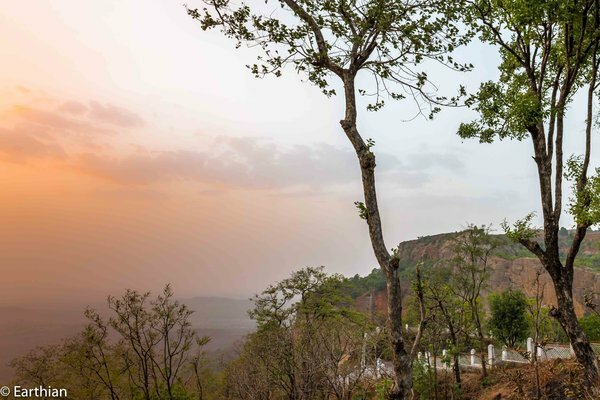 "Just about a kilometer through those fields and you would reach the (main) road and then Karamjhiri is just round the corner." said a worthy. Having had many experiences about "just round the corner" statement made by friendly but oblivious-to-distance villagers, i was understandably wary. I had some trepidation of having my car stuck in the middle of the field, in the middle of nowhere. To add insult to injury, my wife innocently asked me whether i was concerned about the car and if so, as to why we bought such an expensive SUV if it could not handle such small off roading? This goaded me into action and we sailed forth through the fields and such. The SUV was worth every rupee and it did not even blink. Presently we came to a road and managed to find our way again to the correct way towards Karamjhiri. The FRH at Karamjhiri are beautiful and located just inside the gates to the national park. They are spacious, simply, yet adequately appointed and constructed out of locally available materials as far as possible. 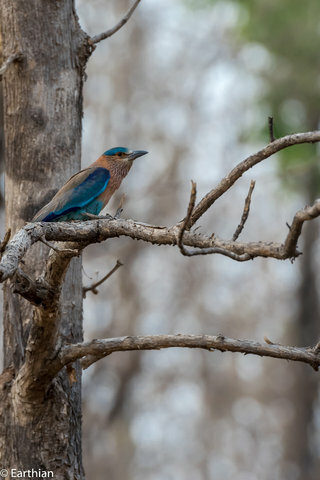 The advantage is that they are on the periphery of the jungle and one can sit in the evenings in the verandah and enjoy the birds twittering about. The staff is efficient and the food is well made and presented. Milk and milk products are not available, and we went out to the neighbouring village one evening to stock up on these. Cellphone connectivity is not available, thankfully. However, Jio network has managed to enter here too. I had recently got a flash extender and took the opportunity early in the morning to try out the reach of the flash. The reach is pretty good. I desist from using flash on wildlife, and this was quite an unnecessary purchase since i probably won't use it in the forests. We spent two days here and had a lovely time. I enjoy the forest and all that it offers. Though tiger sightings are welcome and quite thrilling, i am contended even if i don't have a tiger sighting. 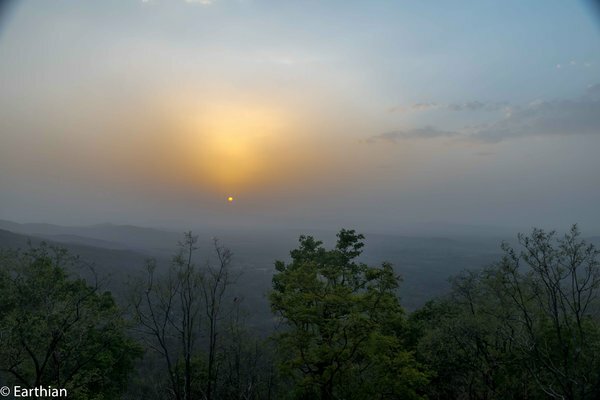 The Madhya Pradesh side of Pench is quite rugged and there are not many visitors here. Particularly at the Karamjhiri gate. Permits are easy to get (unlike Tadoba) We had a tiger sighting, saw a sleeping leopard (poor photos), and a host of other animals. 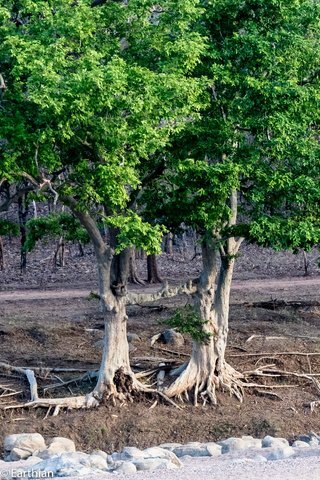 This is the famous tree(s) on the banks of the Pench river where one can see two trees co-joined, making an "H" shape. The half way interaction area where one may get down, stretch one's legs and use the conveniences. Gypsies from Turia and Karamjhiri stop here and compare notes. 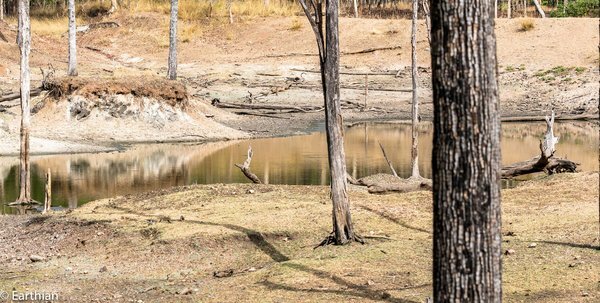 Water shortage is the reality in most forests in central and North India, necessitating the making of artificial water bodies. Some States make the water bodies as natural as possible where as in some states one can see garishly painted concrete troughs (akin to horse troughs). 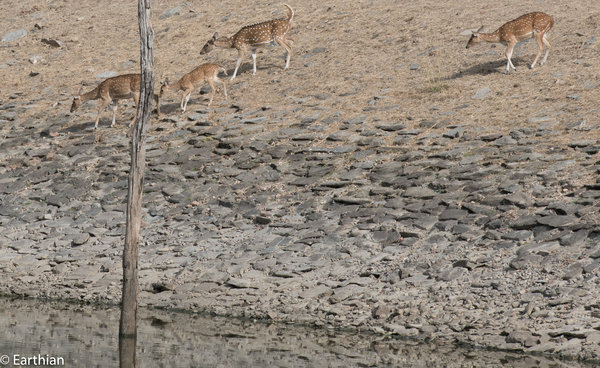 Gir sanctuary in Gujarat is guilty of such artificial water bodies. 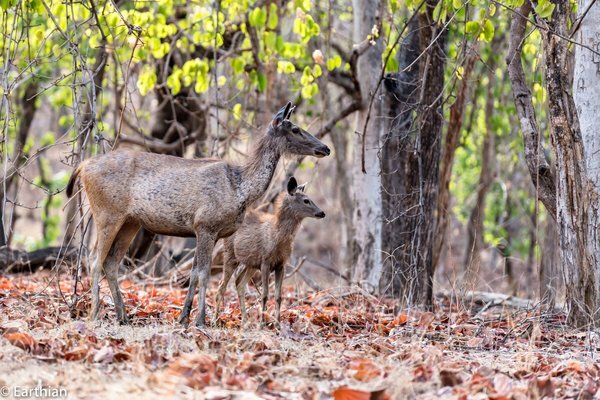 The ones in Pench were far, far better. They had used natural land contours to the maximum extent possible as can be seen. Kudos to them. 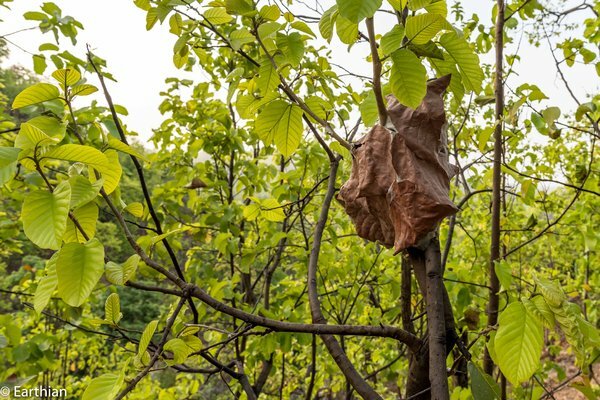 The Government of Madhya Pradesh and the Forest Department have set up tourist interaction areas where awareness about the jungle and environment in general is propagated. Souvenir shops selling coffee mugs, T shirts, caps and hats, camouflage clothing, and other items of interest have been set up. The prices are reasonable and the quality tolerable. Toilets have been set up at such spots, though the overall cleanliness is not up to the mark. 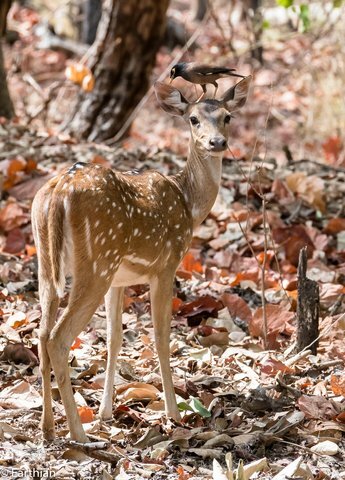 Pench National park, nestling in the lower southern reaches of the Satpura hills is named after Pench river. 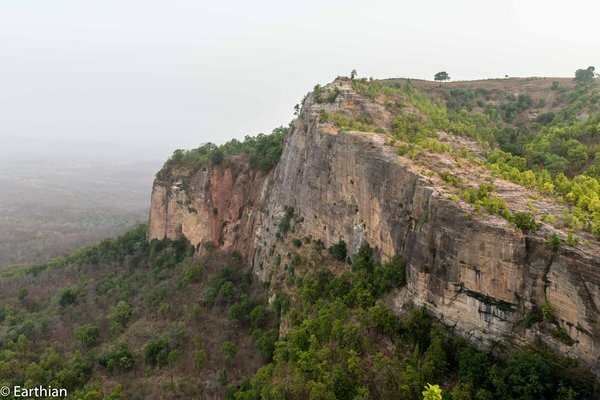 It is located on the southern boundary of Madhya Pradesh, bordering Maharashtra. It is mainly a dry deciduous forest. 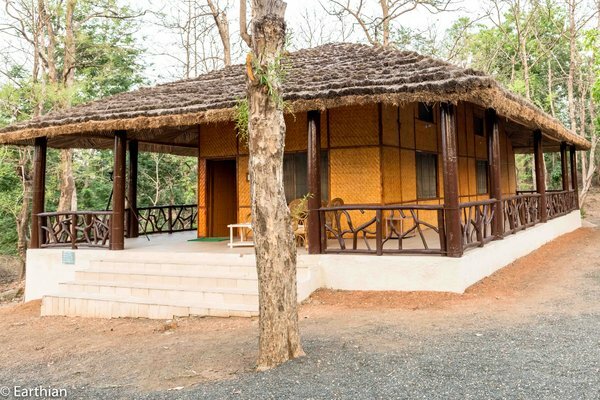 We enjoyed our brief stay at Pench. 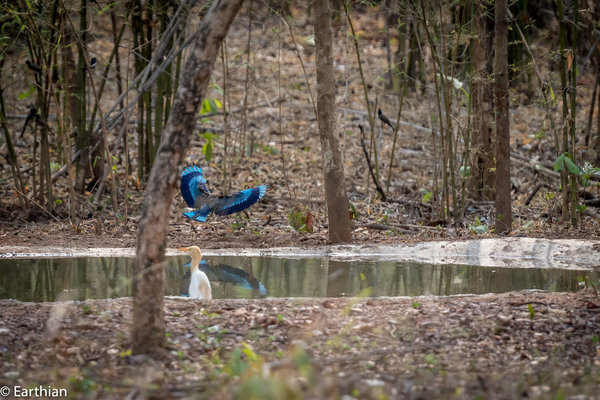 Our next destination was Tadoba, where we were to spend four days. 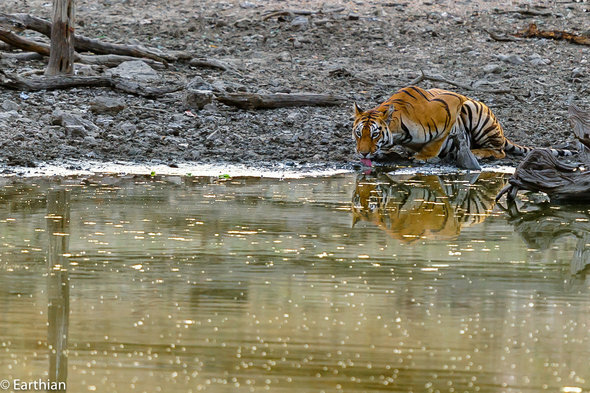 On the 22nd morning, we left for Tadoba after a hearty breakfast. The road was very good and we made good time. 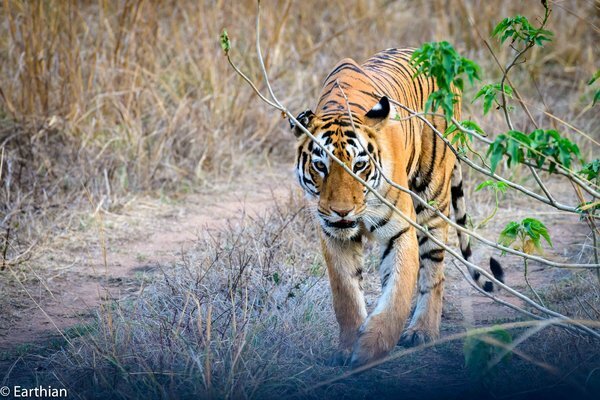 It is obvious that Tadoba is an important tourist destination. 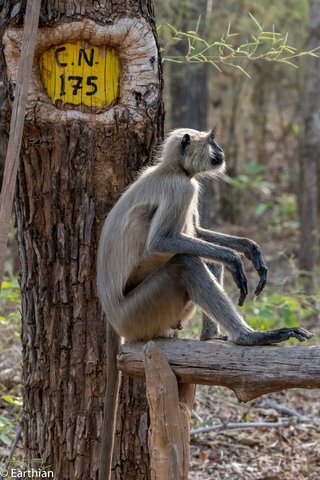 There were sign boards at all vantage points and except for a tricky turning (at Tadoba village) to go to the MTDC resort where we were staying, we did not have to ask anyone for directions. We arrived much before the estimated time of Google maps and checked in. We were staying in the deluxe cottages adjoining the reservoir. It was blazing hot. The walk from the parking place to the cottage-some 50 meters or so-at 1 pm under a fierce sun, nearly roasted you. There was a reservoir behind our cottage and one could photograph birds sitting on the verandah, thoughtfully provided for this purpose. After a quick lunch at the cafeteria, we were ready for the afternoon safari, gypsies for which starting arriving from 1430 hrs onwards. Our first safari was in the core zone. We had just entered the zone when we saw this magnificent specimen. 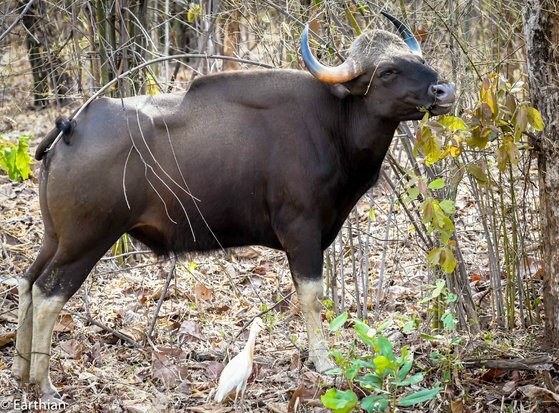 I like the way, the Gaur's tail has overlapped the slender bamboo. It looks as if it is flogging itself! Soon afterwards, we came upon this tiger which had just killed a wild boar. 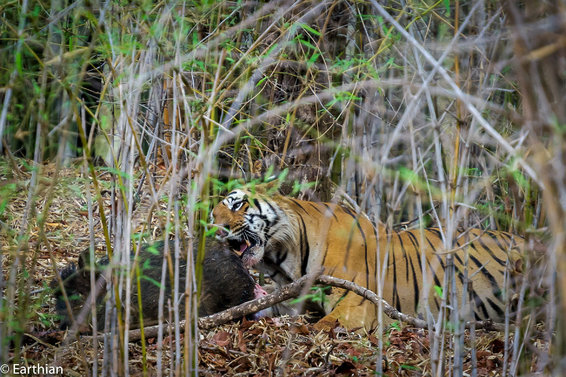 It seems that the tiger's favourite prey is the wild boar, followed by the Sambar. Though the wild boar looks stocky with short legs, it can run at an astounding pace, especially when its life is in danger, as we were to witness on the last day of our safari. In my excitement, as usual, the camera settings were skewed, and hence my photographs of the exciting chase are bad. But that's another story. It likes the gaur but finds it difficult to bring down, unless it has help. As usual, when ever a tiger is sighted, hordes of gypsies arrive akin to vultures at a rotting corpse.If the Gypsies (and it's inhabitants) were to just quietly observe in a disciplined manner, i have no problem; but when they hassle the wildlife by surrounding it and not allowing it to move freely, then i do have problem. We observed this during our last day when a tigress- Madhuri- was surrounded by gypsies. But more on that later. Presently, the tiger took a breather and i was lucky to get a clear shot. We moved on so that others could enjoy the sighting. 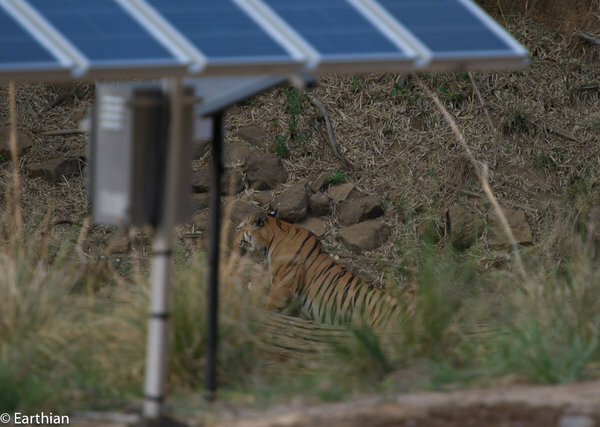 The forest department has installed solar pumps to augment scare water resources in the Park. 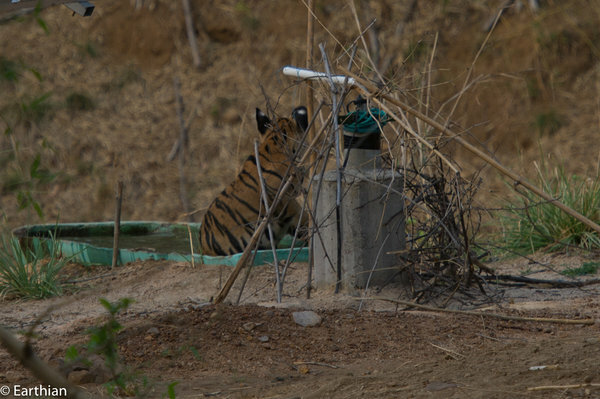 Some of these pumps have a big plastic tub -possibly far storing water for priming purpose - and one of these tubs seemed to have caught the fancy of this cub (Sonam's). The Cub's Tub. I appreciate the effort made by the forest department in ensuring that wild life survive during these harsh and demanding times. My only grouse is that we could go the extra mile in ensuring that such facilities are camouflaged and discreet. 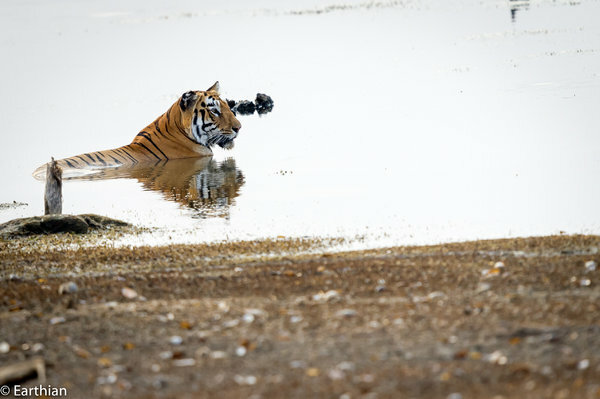 The cub tired of its bath and moved on. There was a flurry of excitement amongst the Gypsies. Matkasaur, the big daddy of Tadoba had made his entrance. He posed for a bit, allowed the shutterbugs to get their jollies, and moved on. 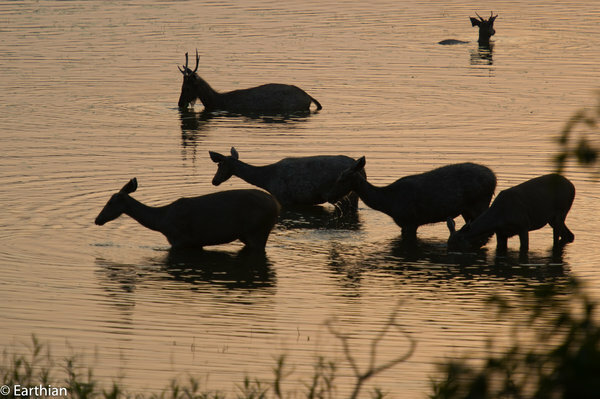 The core zone has few natural water bodies and in one of them, it was a delight to see the spotted deers silhouetted by the colours of the setting sun. We returned to the resort, contended and happy. 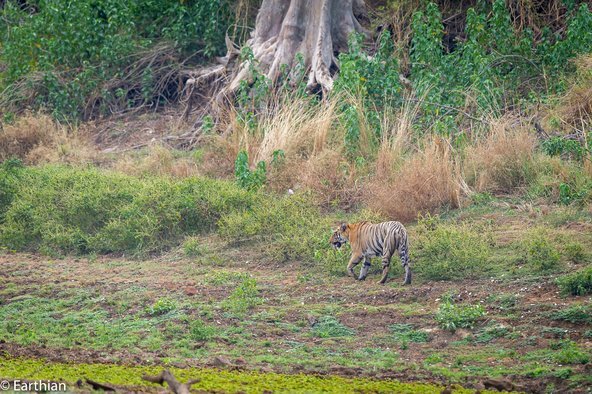 We had 3 tiger sightings on the first safari itself! Very interesting report, Earthian, with lovely clicks. I look forward to enjoying the pics properly on the PC monitor when I get back to India and home. Would you be back by the middle of August? Thank you, Nycank. Aim to do exactly that. This one's not over yet. The early morning safari starts at 0600 hrs and one has to stop at the entrance gates, pay the guide fees, get the permit checked, get the guide and get in line to be as far as possible ahead in the queue. The reasoning is that often a tigress and her cubs sit on the road in the night to escape the pestering bugs, flies and what not. Possibly during the summer months, in the night and early mornings, it is more airy in the open then in bushes. With this in view, forest aficionados try and to enter the forest first so as to catch this sight. 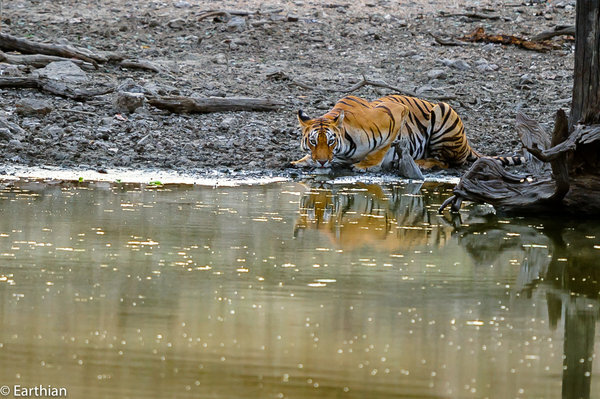 The tigers move on tired by the noise and fumes and hence later entrants to the Park my not see these sightings. 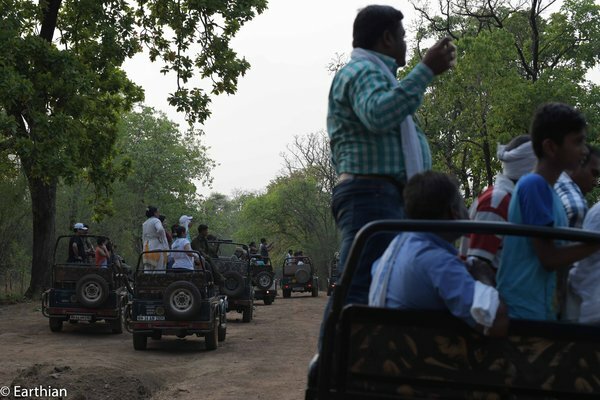 I impressed upon the guide and the driver that i would like to enjoy all that the forest has to offer - not just tigers. 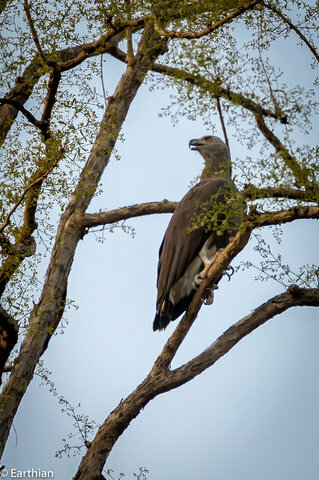 We saw this grey headed fish eagle and i took a shot, though it was quite far away. This photo has been heavily cropped. 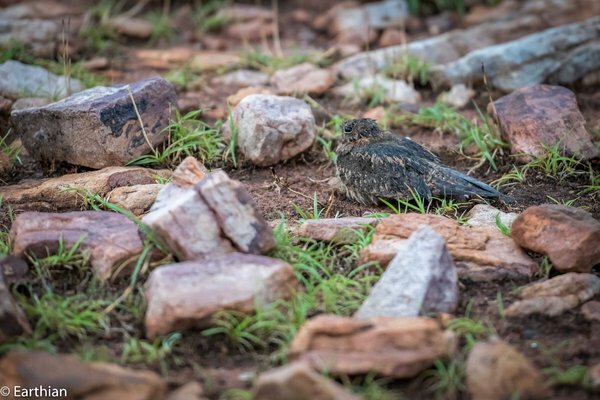 I told the guide that i would like to see a nightjar and off we went searching. It was drizzling slightly and suddenly the guide asked the driver to stop and reverse a bit. Excitedly he pointed out: Savannah Night Jar. Try as i might, i could not locate the bird. 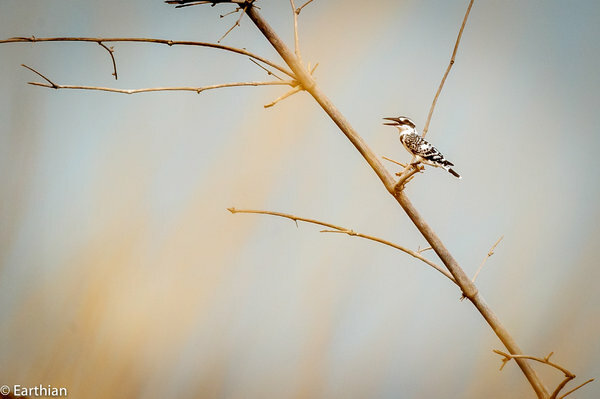 These birds are known to remain absolutely still and sort of merge with the surroundings. After some nerve wracking minutes, i spotted it and took some shots. We were puzzled as to why its wings were spread, particularly in the drizzle. One could understand if it was drying them after the drizzle. The night jar starting slowing waddling out and moving away from us - slowly though. Our eyes followed it and after about10 meters or so , it stopped. Our guide, puzzled by its behaviour, found the answer. It was shielding two nestlings, probably recently hatched. It was pulling away so as to divert our attention. 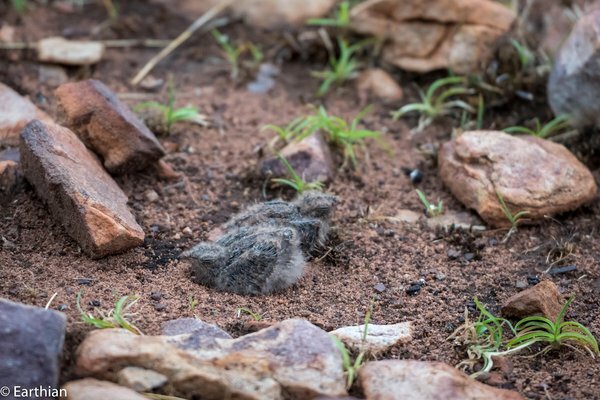 If the Night jar was difficult to spot the hatchlings were doubly difficult. Even in this cropped photo, unless one knows what to look for, it is difficult. 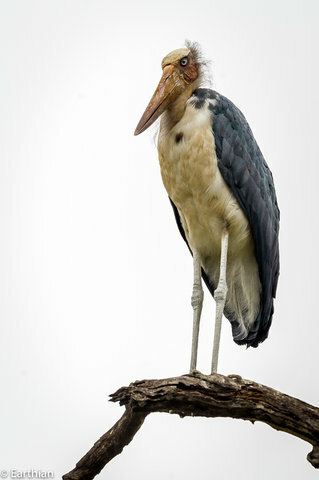 The Lesser Adjutant looks like a professor in my eyes and with its unkempt hair and beady eyes looks like Dr. Emmett "Doc" Brown of "Back to the Future" fame. 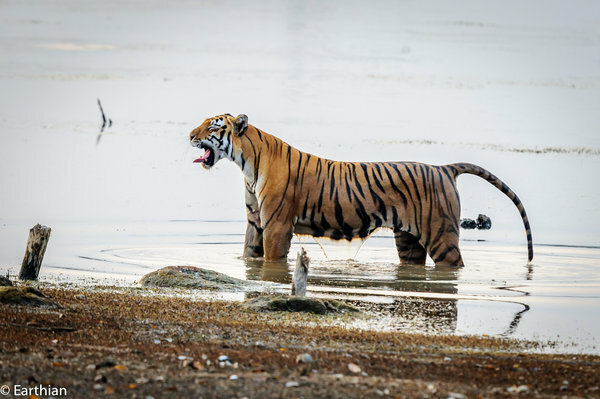 We waited by the water body for - what else - a tiger sighting. 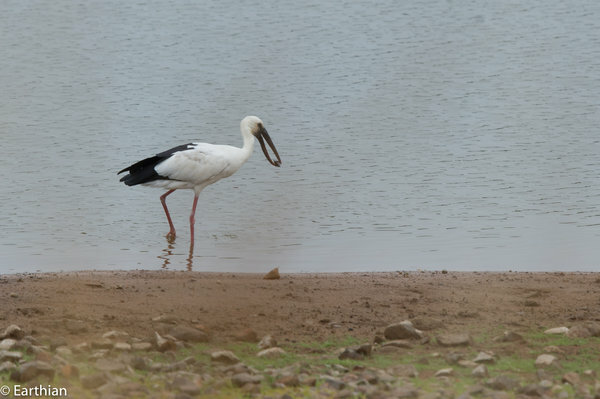 I passed the time getting shots of a Honey buzzard, a pied kingfisher and an Asian open billed stork. Waiting is part of the deal if one wants to get sightings of wild life. One has to have the patience to sit quietly and become a part of the surroundings. Unfortunately, there is a constant coming and going of gypsies to these preferred points and as such the harsh sounds of the starter motor and engagement of gears effectively ensure that you stick out like a sore thumb. 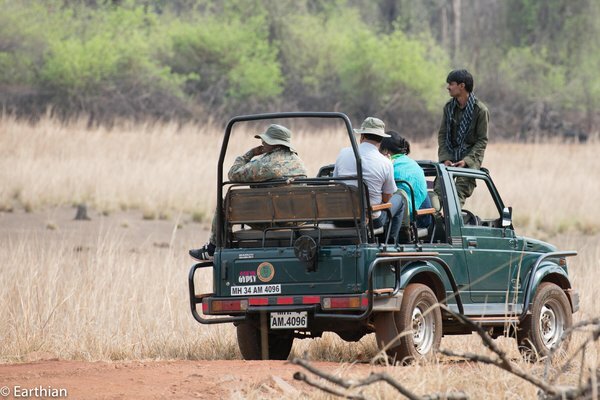 The safari system at Tadoba is neatly organised. 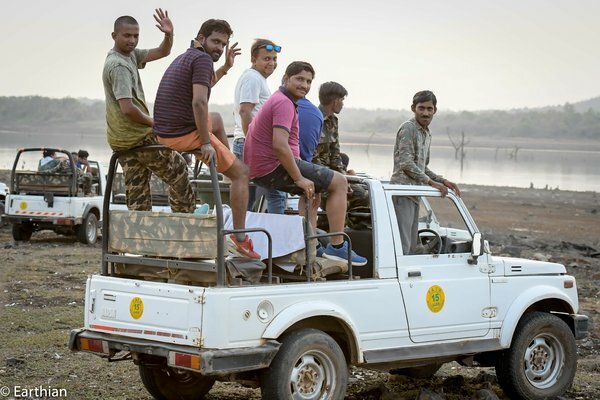 Most of the guides and drivers are local boys who have been trained by the forest department from time to time. The guides have some knowledge about the flora and fauna, but over time due to tiger-centric visitors, their knowledge of other aspects of the jungle has diminished. There is another worrisome trend that seems to be catching on. The possibility of earning money on Google, You tube and the like have made some guides carry cameras and video recorders with them. 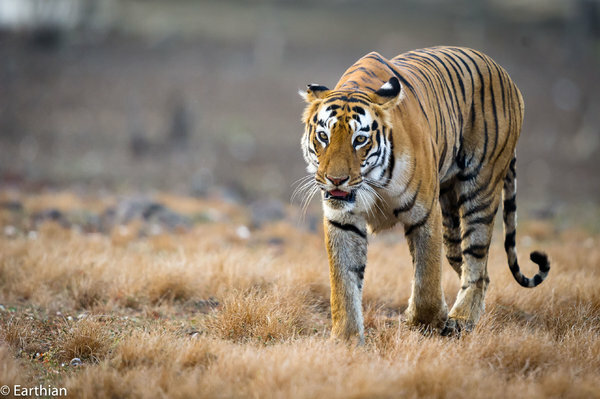 When there is a tiger sighting, they seem to be hell bent on capturing the action, throwing caution to the winds and at the cost of harassing the tiger. 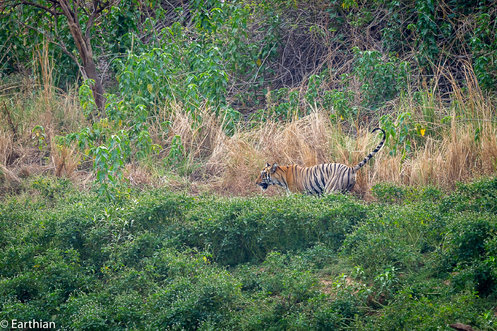 We had one such guide, who in the guise of giving us the best sighting by asking the driver to cut off the tiger's path; was really only interested in getting his shots and videos. When we cottoned on, we sternly ticked him off. However, i can understand that for the casual tourist who can neither afford the time and money to hang around wild life sanctuaries for an extended period of time - such guides are the best. In the Masai Mara, all kills are immediately monitored by the Jungle Patrol and any one seen harassing the wild life are reported. Some system on similar lines would be required in India too, given the keen interest in wild life nowadays. We were watching the grey headed fish eagle and i was anticipating a BIF shot when suddenly the guide asked the driver to take off, much to my annoyance. A tiger had been sighted. 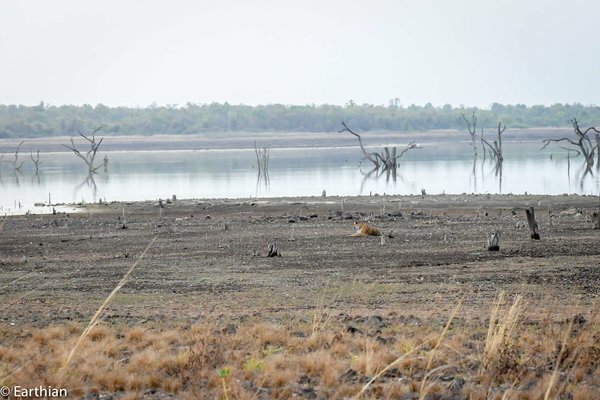 We went helter-skelter to the back waters of the dam, where then tigress was supposedly taking her evening dip. She sat down on the banks of the water body and we also sat there watching her. This time there was no jostling for sighting since we were on open ground and there was plenty of space for every one to park the Gypsy. I mentioned earlier that the buffer affords quality sightings. The buffer is open and the water bodies are natural. 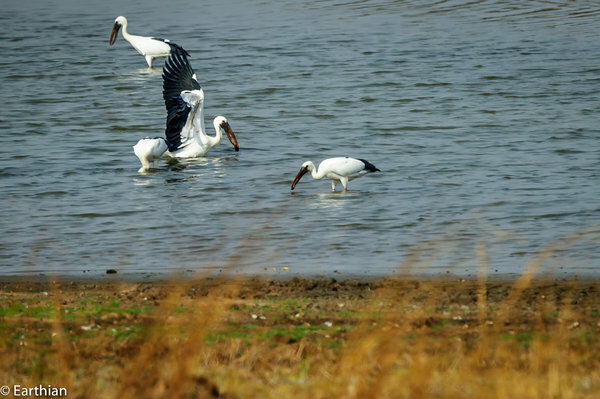 Sightings around the water bodies are not only free from distractions, but last quite some time. One can get shots of sitting, walking and even hunting as we did. Our Gypsy was parked such that there was a big gap between our car and the adjoining one. 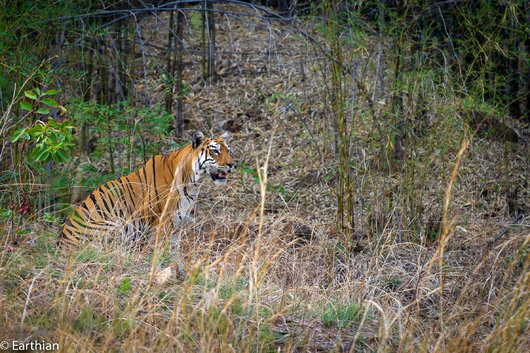 Our guide mentioned that the tigress would possibly cross in front of our Gypsy due to the open space and that we wait. So we waited. I passed the time taking photos of these young men who were also waiting. Madhuri decided that she had enough of sun bathing and that it was time to leave. As luck would have it, she crossed in front of our Gypsy. 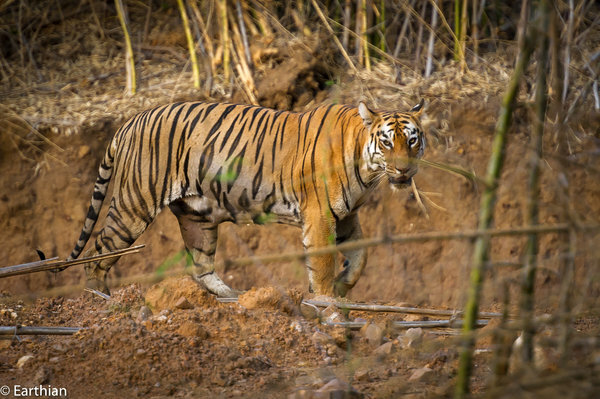 We had tiger sightings in almost all the safaris. We had three safaris in the core zone and five safaris in the buffer zones. 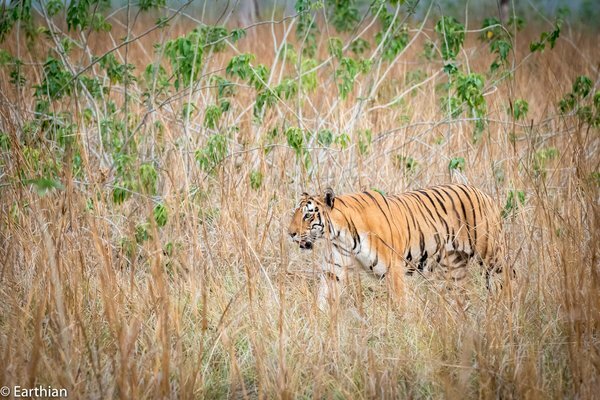 Quality sightings of tigers are in the buffer, no doubt. The core offers much more opportunities for birds and other animals. 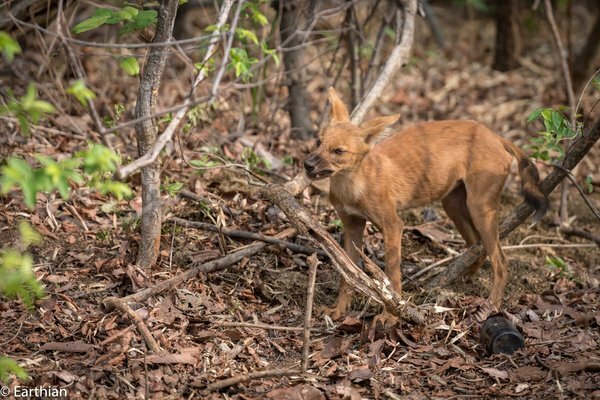 Wild dogs are generally hard to spot and harder still to photograph. They generally shy away from human contact. 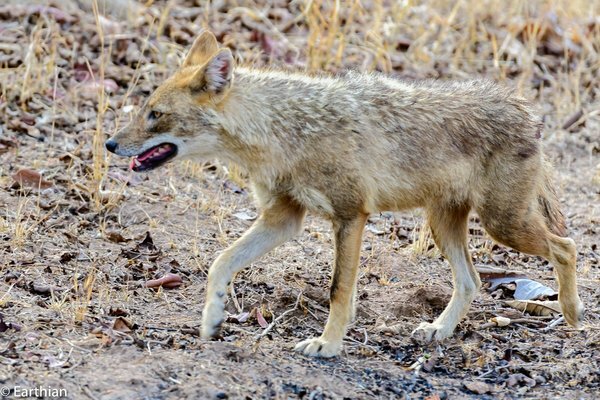 Tadoba seems to be an exception, though. 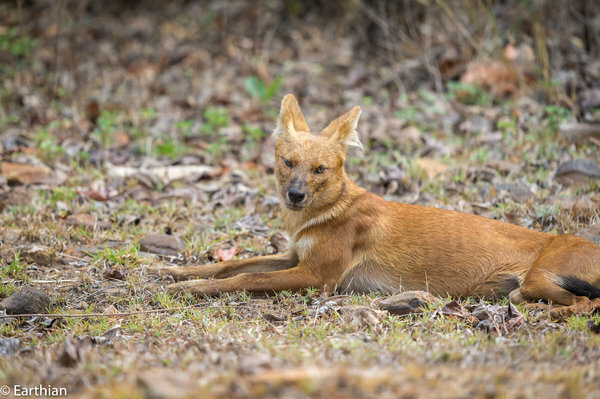 Not only did we see three wild dog packs, but could photograph them too. They posed too, as can be seen in this shot of the Alpha male gazing at me. This scrawny looking specimen was intent on crunching and chewing some bones that he had ferreted out and was not going to be disturbed by me. Much of our time was spent hanging around water bodies, natural or man made, and waiting. Unfortunately, these water bodies are situated quite far from the road and getting quality shots of birds is difficult due to the melee of gypsies jostling for better viewing position. I had badly scratched my Nikkor 70-200mm f2.8 VR-II lens in the morning before the safari (having dropped it and broken the UV filter, which in turn scratched the lens) and i was anxious to see if it worked. There are some spots where the focus is fuzzy and I guess I would have to replace the top glass. The behaviour of wild life is interesting to watch. 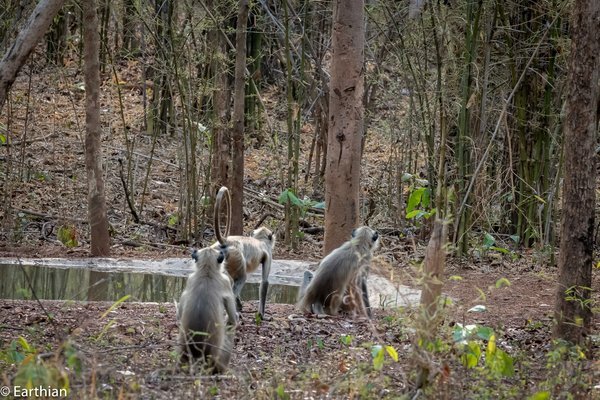 There were these monkeys who wanted a drink of water. First one came and sat at a vantage point and studies the surroundings. Next two more appeared and proceeded with caution to the water hole. One kept watch whilst the others had a drink. Next the others watched while the first one quenched his thirst. It happened matter of factly and showed the maturity and intelligence of these animals. Humans have a long way to go. The inevitable phone call came and away we went to the same place as yesterday- the back waters. 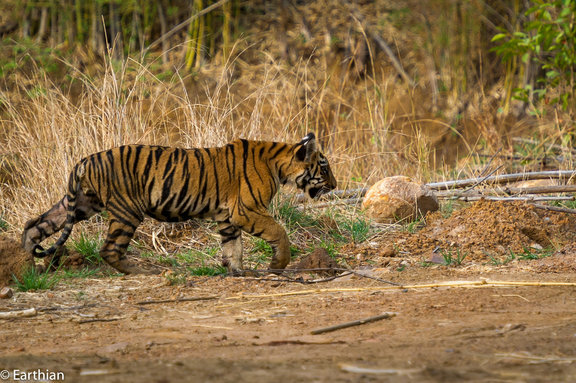 And got there just in time to see the tigress walk towards us. 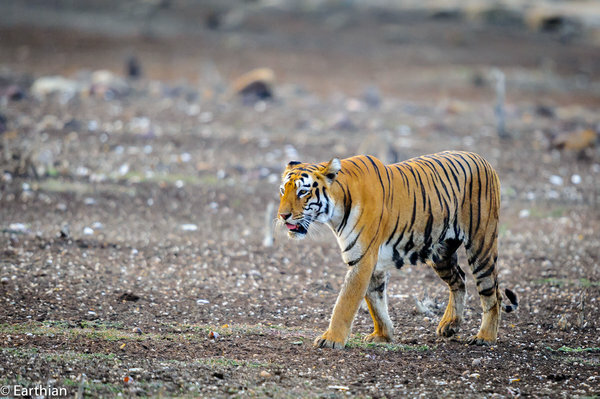 Our driver hastily started backing away and the tiger majestically followed us. Wonderful photos & a nice TR as usual. Thanks a lot Earthian . We had three safaris in the core zone and five safaris in the buffer zones. 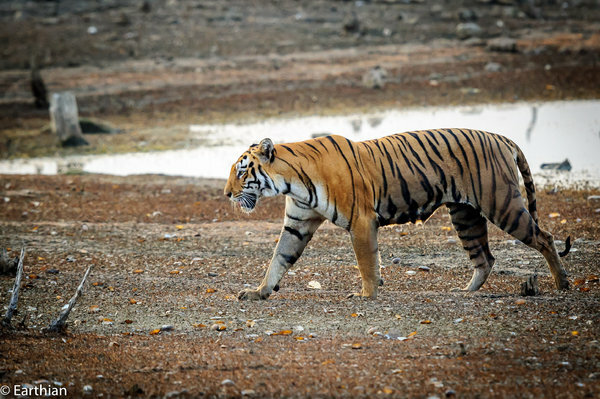 Quality sightings of tigers are in the buffer, no doubt. The core offers much more opportunities for birds and other animals.